Men and Mood Swings! Testosterone & Male Attitude! I wrote an article yesterday about a man in my neighborhood suffering from low testosterone, severely decreased muscle mass, and other hormonal issues. Today, I'm going to write about another guy that lives near me. So different in fact that I'm absolutely convinced he's injecting testosterone. He's in great shape, I'll admit that, but he's hostile, moody, and so aggressive that he's downright difficult to be around sometimes. Him and I are very similar in some ways, but at the core, we're entirely different people. While I use OTC supplements and other natural methods to maximize my hormone levels, he's chosen a different path, and it shows. His physical condition and his behavior prove this to me beyond a shadow of a doubt. For one, he's got a neck that looks like it belongs on a rhinoceros, more than it does a human being. His mood swings, and hostile behavior are the most telling though. You never know, from day to day, what you're going to get out of this guy. One day he's up, chatty, and friendly, and the next all you can get out of him is a scowl, a grunt, and if you're lucky, a weak smile. 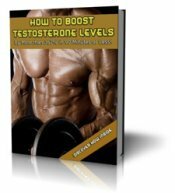 As I've mentioned before, it's virtually impossible to spike testosterone levels, and keep them elevated for days at a time, while injecting. Immediately after the injection everything will be fine, but several days later, the buzz will wear off as the hormones begin to decline in the body. Then it's straight back to the needle and the next artificial high, followed up once again by the inevitable crash and severe lows that always follow. I can always tell when he's recently injected testosterone. We live in a planned community, with a walkway that runs around a man made lake. He walks the path most evenings with his woman, and I walk the same route with mine. When he's juiced and horny and happens to pass our way, he'll stare at my wife from head to toe, without glancing away even once. Remember the obnoxious behavior I mentioned earlier? But, when he's crashed hormonally, he doesn't even have the confidence to take his eyes off the pavement. I can spy his yard from the window in my office, and when he's up, he's all over the place.... washing his car, mowing his lawn, riding his bike. But when he's down, he hides out in his house, sometimes for days at a time. Like all men, I have my down periods too. A blast of diesel fumes, a toxic meal, or a bad run in the sleep department can send me on a hormonal tail spin, just like any other man. And when those days come, and I begin to question my own methods, all I need to do is think about the guy with the rhinoceros neck, the mood swings, and the bad attitude. That's all I need to convince myself, beyond a shadow of a doubt, that I've chosen the correct course of action in my life.